Last month, Walkabout Foundation teamed up with a new partner, Millennium Promise, and travelled to Ghana to individually distibute 250 RoughRider wheelchairs to adults and kids in need in the district of Bonsasso. After endless hours of travelling from New York to London, to Accra, then Kumasi and finally to Bonsasso on multiple flights and bumpy roads, Carolina and Monica Gonzalez-Bunster arrived on November 14th to host a training programme to 25 local Ghanaian on responsible wheelchair provision, distribution and fittings. The training programme consisted of a day of theoretical classroom work (learning about World Health Organization disability guidelines) and a day of practical hands-on work (learning about wheelchair assembly and mechanics). The training culminated in going out into the surrounding villages to individually fit hundreds of beneficiaries to their new chairs. There is one particular story that stands out among the hundreds we came across while in Ghana. It is the story of Adwoa who arrived crawling on his arms and legs. 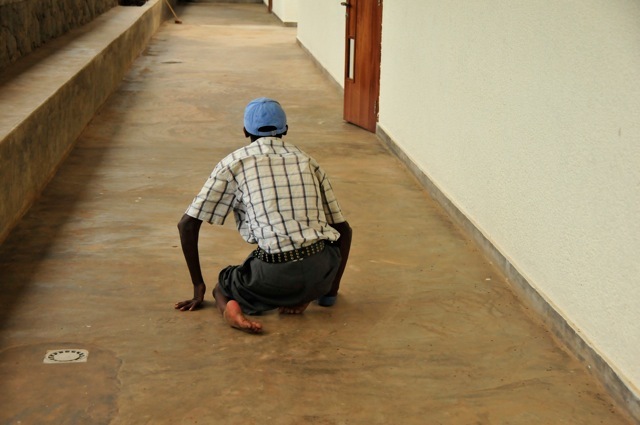 When he was 3 years old he developed a physical disability which prevented him from walking ever since, and as a result, has spent the last 30 years of his life crawling “like a gorilla” he says. 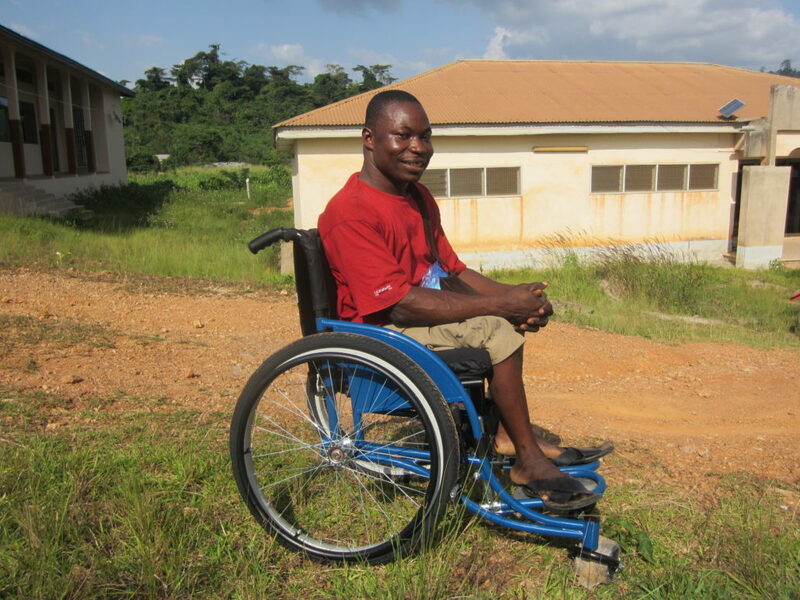 Despite his disability and never having sat in a wheelchair before, Adwoa, shoemaker, arrived to us with a smile on his face. When we began fitting him to his wheelchair, he asked if he could help. Before we knew it, he was adjusting the footrest, backrest, seat width, and seat depth of his own new wheelchair! He even began to carve his own pressure relief cushion. 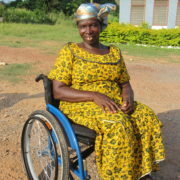 The smile on Adwoa’s face once he sat in his new wheelchair was priceless. This is the difference your generosity makes. 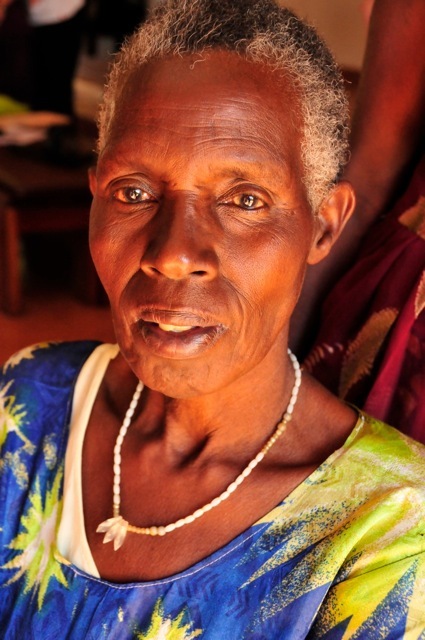 Thanks to your support, Walkabout was able to give Adwoa not only mobility, but also his dignity back. 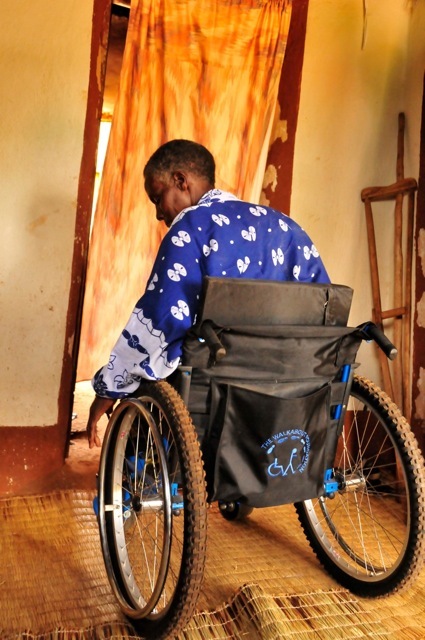 In May 2012, WALKABOUT FOUNDATION teamed up with Partners in Health (PIH) once again to donate and distribute 300 RoughRider wheelchairs in Malawi. After two successful distribution trips with PIH in Haiti and Rwanda, Walkabout was asked by PIH to send a container of wheelchairs to Neno, Malawi, one of the poorest rural districts in Malawi. Carolina and Monica Gonzalez-Bunster travelled over 24 hours to get to Neno and were part of a week-long distribution, which changed the lives of dozens of individuals suffering from mobility disabilities. The week began with a training session, in which local therapists and technicians were trained by a Motivation instructor on responsible wheelchair provision, distribution, and fittings. With over 10 trainees in the 3-day course, Walkabout ensured a sustainable initiative whereby Rajiv, Peter, Macfarry, Bridget, and Margaret (to name just a few of the trainees) will be able to continue the distribution of the hundreds of wheelchairs Walkabout has sent to Malawi. There are countless stories from our trip to Malawi but there are always a few that stand out in our minds, like the story of Ruth, a 14 year-old teenager who cannot walk and is carried everywhere on her mother’s back. Or the story of Editha, 8 years old, who was born with a congenital birth defect and looks more like a toddler and is also carried everywhere on her mother’s back. 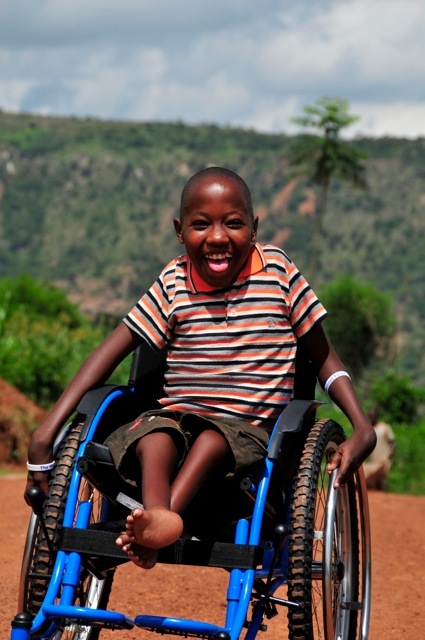 And the story of Philip, 19 years old, who arrived at our distribution in Lisungwi crawling and dragging himself on the dirt ground, only to then show us the biggest and brightest smile when he sat in his new RoughRider wheelchair. Our successful distribution and memorable week in Malawi would not have been possible without the help of PIH, remarkable staff members on the ground in Neno, especially Amanda Schwartz and Robbie Flick, and our donors’ generous contributions that allow us to make our mission a reality. 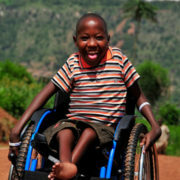 WE HOPE THIS IS THE FIRST OF MANY WHEELCHAIR DISTRIBUTION TRIPS TO MALAWI! We are incredibly proud to announce that Walkabout has pledged to donate 10,000 wheelchairs to Haiti over the next five years. On Wednesday, May 14th 2012, Walkabout Foundation was invited to attend a special ceremony and press conference in Port-au-Prince with Gerald Oriol, Haiti’s Secretary of State for the Integration of Persons with Disabilities, in order to publicly announce its commitment to donate 10,000 wheelchairs to Haitians with mobility disabilities throughout the country. The wheelchairs will be donated over the course of 5 years directly to Secretary Oriol’s Bureau for the Integration of Persons with Disabilities, which will then work with local organizations to ensure that the wheelchairs are distributed and delivered to the people that need them most. It is estimated that thousands of Haitians were physically injured by the devastating January 2010 earthquake in Haiti, in addition to the thousands of Haitians that were already living with amputations and mobility disabilities within the country. Representatives from over 30 NGOs attended the ceremony and press conference, but the highlight of the event was a special visit by President Michel Martelly and Prime Minister Laurent Lamothe who came to support our initiative and express their own personal commitment to focus on the plight of Haitians with disabilities and support our wheelchair donation. Additionally, Walkabout Foundation sent a summer intern, Simon Morgan, who is pursuing a Masters in Public Health at Columbia University, to work alongside Secretary Oriol in Port-au-Prince to establish a strategic plan for the efficient and responsible distribution of the 10,000 chairs. In February 2012, WALKABOUT FOUNDATION transformed the lives of 300 men and women across Islamabad, Lahore and Karachi. These individuals, struggling with mobility disabilities in Pakistan, were provided with RoughRider wheelchairs which are exclusively designed for the rugged and rough terrain of the developing world. One recipient, Adeel Ahmed, writes: “your wheelchair has changed my life… it has given me freedom which I could not feel before…” Thank you to our local Pakistani partners, Mahvash and Jahangir Siddiqui Foundation, and a special thank you to Ali Munir without whom this distribution would not have been possible. 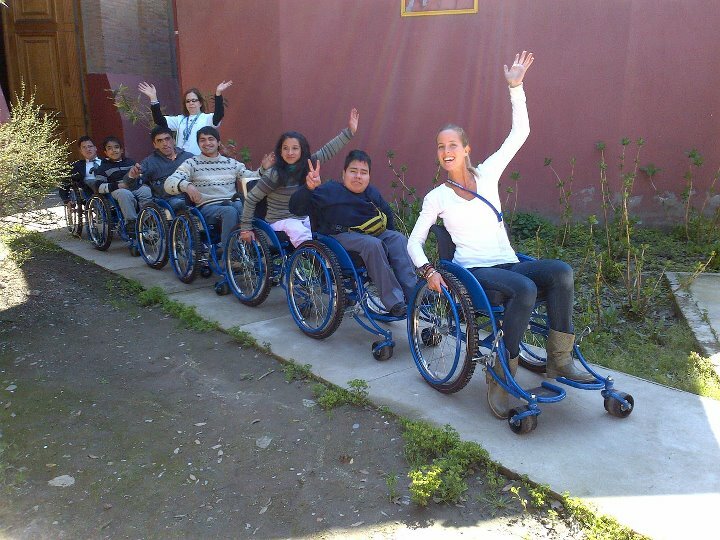 On 2 September 2011, Walkabout Foundation, represented by Carolina and her mother Monica, director Marissa Sackler, and summer fellow Katrin Alberding from Harvard Business School, travelled to Chile with the Gabriela Mistral Foundation to personally deliver 300 RoughRider wheelchairs to individuals affected by all different sorts of mobility disabilities and the February 2010 earthquake, the fifth strongest earthquake recorded in history. The week began with a training session for local therapists, doctors, and physicians in San Bernardo and an opening ceremony attended by Joaquin Lavin, Chile’s Minister of Planning and Social Development, as well as representatives from the National Office of Disabilities and local authorities. In the ensuing day, we travelled up and down the country distributing wheelchairs throughout San Felipe, Valparaiso, Rancagua, Talca, Concepcion, and La Serena. In each city we visited, we met the most remarkable people, like Martin, a young man in Rancagua, who pushed his old dilapidated wheelchair over 20 kilometers each day to work at a supermarket. In Valparaiso, we met Eduardo who is a double amputee and was selling Band-Aids on the street, and in Talca we met Solange, a 19-year-old paraplegic, who has lost a kidney, is deaf, and is also an orphan. She had the brightest smile and at the end of the day delighted at by dancing a “cueca” in her new RoughRider wheelchair as a way to say thank you. 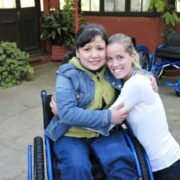 In one week, the Walkabout Foundation was able to give 300 Chileans a new wheelchair and the possibility of living a more independent, productive, and fulfilling life. Last week Walkabout Foundation returned from its first trip to Rwanda with one Kinyarwandan phrase we will never forget “seka cyane”, which means “big smiles” and big smiles were exactly what we were greeted with everywhere we went. Walkabout delivered 250 wheelchairs to be distributed to people with mobility disabilities in Rwanda with the help of Partners in Health. 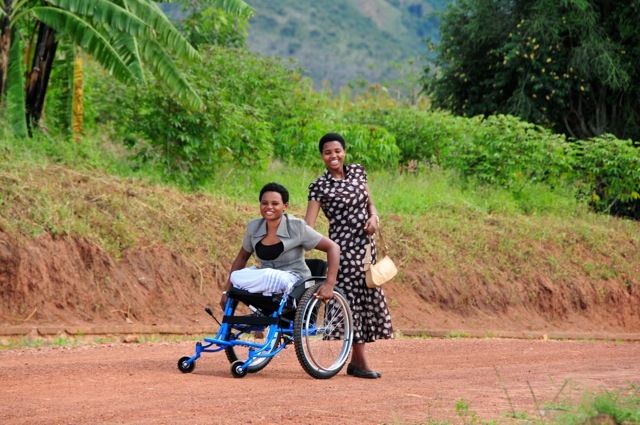 While in Rwanda, Walkabout fitted over 20 individuals to their new wheelchairs. Here are some of the life changing stories you helped make happen. We started our trip at Rwinkwavu hospital on April 27th, 1.5 hours from Kigali, with a two and a half day training program that taught seven PIH therapists and doctors from different districts how to fit and adjust the Rough Rider wheelchairs and how to give the best care to patients with physical disabilities, particularly spinal cord injuries. With the successful completion of the training program, word spread around the villages and communities that Walkabout was at PIH distributing and donating wheelchairs. Before we knew it, we had lines of people showing up that had travelled hours and hours to be fitted into their new wheelchairs. One of those visitors was Frank! Frank has the biggest smile you’ve ever seen. He was born with a congenital birth defect which left him without the use of his legs. With no access to a wheelchair, Frank has spent the last 12 years dragging himself along the ground in order to attend school. Despite such hardship Frank has a constant grin on his face and an infectious giggle. Once fitted in his wheelchair, Frank proved to be a natural at pushing himself around. Having discovered the extraordinary fre.om of mobility that his first wheelchair can bring him, the joy and hope on his face was overwhelming and priceless. The first thing that struck us about Solange was how neatly and professionally dressed she was, which is no small feat for a woman who arrived at PIH dragging herself along the dirt road. Her left knee had a make-shift pad strapped around it to soften the impact of the ground as she dragged herself on the street. Solange was also born with a congenital birth defect that to a large growth protruding from her left leg as you can see in the photo. Furthermore, her legs never actually grew and have no strength or muscle, which has left with the inability to walk. Solange was slightly shy at first but once in her wheelchair, she could not contain her delight, and when she finally headed home in her new chair, she turned back over and over again to smile and wave and thank us. We met Ruthie outside a market in Ginyesi the day before. Having lost the use of her legs as a result of polio, Ruthie has been unable to walk since childhood. Men we met her, she was sitting in a wheelchair that was rusted and tilted heavily to one side. When we asked her if she could move herself in it, she said she was unable to roll in it because the chair would fall apart. 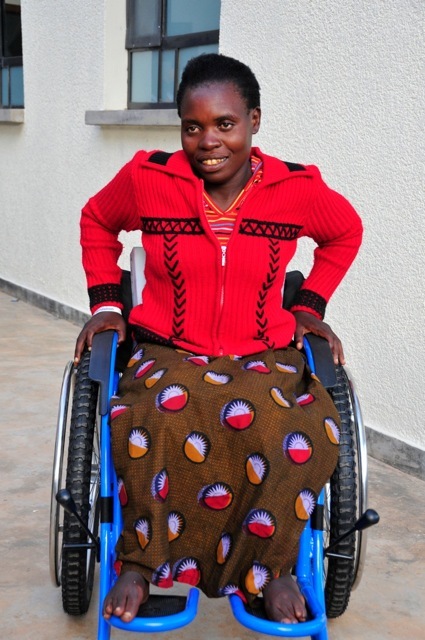 As a standard hospital wheelchair, which is heavy, bulky and not meant for active lifestyles, her original wheelchair had been unable to cope with the rugged terrain of Rwanda and Ruthie had been reduced to begging outside the market as she was left immobile. We invited Ruthie to come to Butaro and were so excited when she and four others had found their way, traveling over 3 hours to get there. Once fitted with her Rough Rider, it was hard to stop Ruthie from whizzing around the hospital and the look of joy at her newfound mobility and independence was unmistakable on her face. Butaro hospital is an extraordinary new hospital built by Partners in Health. Walkabout’s visit to Butaro tumed into our busiest day with 12 individuals fitted to their wheelchairs fitted. Our first rider of the day was 11 year old Alfonse. It took us several minutes to establish that Alfonse was indeed 11 as his legs and hips were so twisted from a congenital birth defect that he was the size of an average 6 year old. 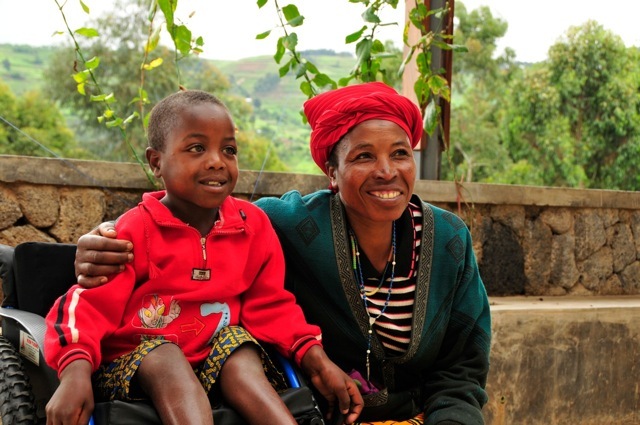 Once in his wheelchair Alfonse’s face lit up as he raced around the ward, completely at ease in his chair and happily posing for photos with his mother. 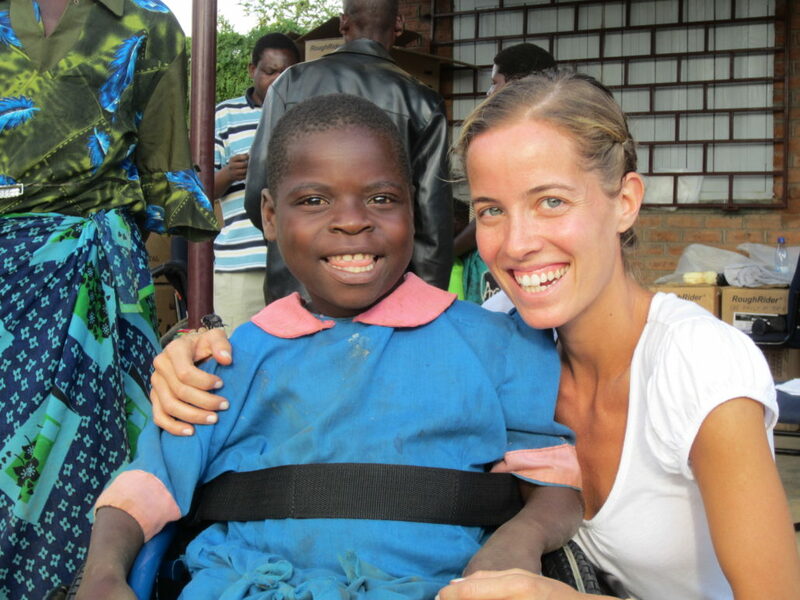 Mathias had travelled to Butaro with Ruthie and had also lost the use of his legs from polio. As he was helped out of the bus and made his way to the hospital, he pulled himself along the corridor with his hands, his legs bent up underneath him, and his feet trailing along the floor. An hour later, having been fitted to his new wheelchair, a smiling Mathias was able to move along that same corridor he had dragged himself down earlier with dignity and ease. Back in Rwinkwavu we had a special invitation to visit Therese at her home in a nearby village. Therese is seventy. She broke her hip and is now unable to walk. She was so excited and grateful to receive a wheelchair that she wanted to thank us by inviting us to her home. We were welcomed with traditional milky Rwandan tea and fresh bananas from the tree outside the front door. It was fantastic to see her using the wheelchair at home and witnessing first-hand how it had changed her day-to-day life. In the span of just three days the whole family had learned to assist her with her new wheelchair, with her five year old grandson carrying the back and seat cushion and placing them correctly for her to sit on. 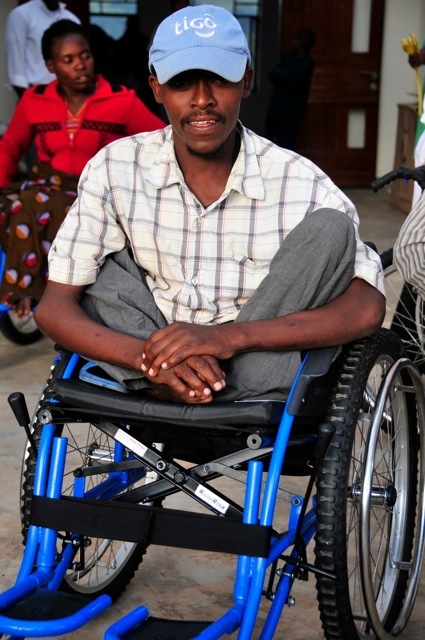 This wheelchair distribution would not have been possible without all of your generous contributions. Thanks to your support Benjamin, Vincent, Frank, Solange, Alfonse, Ruthie, Mathias and Therese now have hope for a brighter future. Their new wheelchairs will allow them to become active members of their communities and lead full and independent lives. “Asante Sana,” thank you for making our mission a reality and for giving our new Rwandan friends a second chance at life. 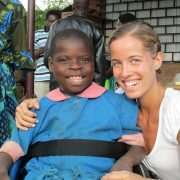 On December 27, 2010, Carolina, her father Rolando, Philippe Chryssicopoulos, Daniele Benatoff and Maria Luz Porcella travelled to Haiti to donate 200 more wheelchairs to Partners in Health (Zanmi Beni) in Port-au-Prince. The wheelchairs have been received by Partners in Health but will soon be distributed to people around the country. The Walkabout team spent the afternoon in Haiti visiting the children who live at Zanmi Beni and playing with the kids that Walkabout previously donated Rough Riders to in May 2010. The Rough Rider wheelchairs are holding up great and everyone seems to love them. Word on the street is that they are the absolute best wheelchair to have! Walkabout was also able to visit Project Medishare on December 27, 2010. Project Medishare was founded by Dr. Barth Green (head of The Miami Project to Cure Paralysis) and is a non-profit organization based out of Bernard Mevs Hospital in Port-au-Prince. Project Medishare is dedicated to sharing human and technical resources with its Haitian partners in the quest to achieve quality healthcare and development services for all. Walkabout donated 50 Rough Rider wheelchairs to Project Medishare in May and went back to visit some of the patients on December 27th. 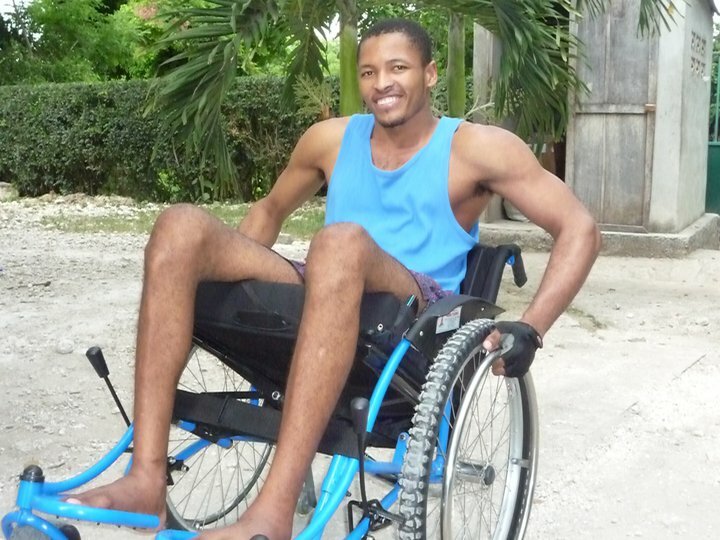 The feedback from the therapists is that the Rough Rider wheelchair is the most suitable wheelchair for the rough and rugged terrain of Haiti, and Walkabout has been asked by several organizations to send more Rough Riders down. Project Medishare itself accommodates 15 spinal cord injured patients and is currently in the process of building a prosthetics centre within the clinic. 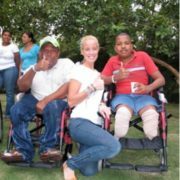 Walkabout Foundation partnered with FUNDACION PIDE UN DESEO to donate 100 wheelchairs in Santo Domingo, Dominican Republic on December 22, 2010. Carolina travelled to the country’s capital, accompanied by her parents Rolando and Monica, and brothers Diego and Matias, to personally deliver the wheelchairs. FUNDACION PIDE UN DESEO, founded by Rosalia Caro, had previously identified the wheelchair recipients, which included children, teenagers, and adults. Among the recipients were people afflicted by paralysis, polio, cerebral palsy, muscular dystrophy, and amputees. Walkabout Foundation is incredibly grateful for the hard work and support of FUNDACION PIDE UN DESEO. These wheelchairs were truly a Christmas gift to the 100 people that received them. Walkabout Foundation travelled to Haiti on May 18, 2010 with 400 “rough rider” wheelchairs manufactured by the social enterprise, Whirlwind Wheelchair International, and was able to fit and adjust each spinal cord injured patient and amputee to his/her chair. Walkabout donated the 400 chairs to Partners in Health and leveraged off of PIH’s infrastructure and network on the ground in Haiti to travel around the country and personally distribute wheelchairs to St. Boniface Hospital in Fond des Blancs, Haiti Hospital Appeals in Cap Haitien, Albert Schweitzer Hospital in Deschapelles, Lambert Sante Clinic in Petion Ville, and Medishare in Port-au-Prince. Walkabout reached out to those in need one by one and listened to their heart-breaking stories, stories of people’s ceilings and houses crashing down on them and being stuck paralyzed in the earthquake rubble for days. 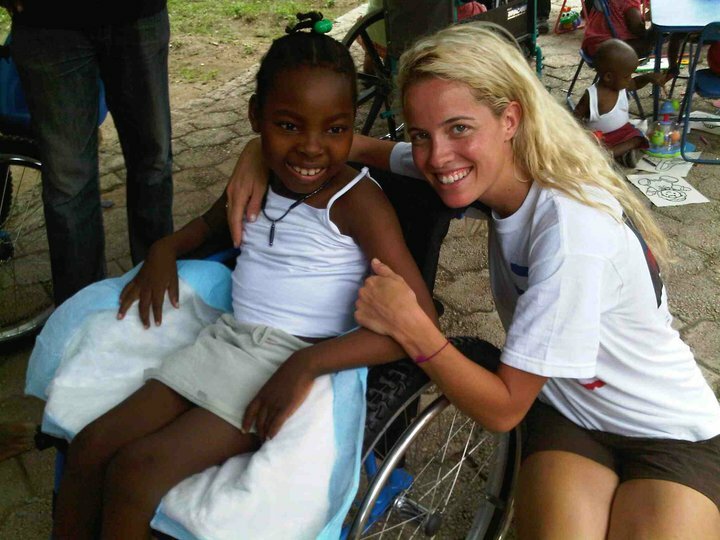 Wheelchairs were donated to people with different injuries, and of all different ages, including a 10 year-old girl named Neftalie who lives with PIH in Port-au-Prince and a 45 year-old mother of five. Walkabout met a basketball player, a local hero, who had been paralyzed in the earthquake, and a 12 year-old boy, Vladimir, who was spinal cord injured when his bedroom’s ceiling fell on his neck. We were able to bring back smiles to these individuals’ faces and hope to their lives by providing them with the wheelchairs that they so desperately needed. Many of the individuals Walkabout met were bedridden prior to the wheelchair donation for lack of a pressure relief cushion and a wheelchair. Today, with their new all-terrain “rough rider” chair, these individuals can venture out again onto the unpaved roads of Haiti to start rebuilding their country and their own shattered lives. These individuals, who were hopeless and immobilized when we met them, have now regained their mobility, freedom, and independence. Walkabout Foundation spent a week in Haiti and was represented there by Carolina Gonzalez Bunster, her parents Rolando and Monica, and her younger brother Diego, a rising sophomore at Georgetown University. On January 18, 2010, 6 days after the devastating earthquake hit the Caribbean nation of Haiti, Carolina and her father Rolando travelled to Port-au-Prince on behalf of Walkabout Foundation. 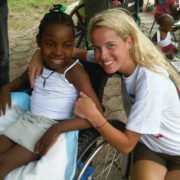 Walkabout Foundation will donate 1,000 wheelchairs to Haiti over the course of the next few weeks and is scheduled to deliver the first 400 wheelchairs on May 20, 2010. Please help the victims of the earthquake regain their mobility, freedom, and independence by donating a wheelchair today. The wheelchairs cost $220 each. They are light, foldable, durable, with all-terrain wheels, and are manufactured in the developing world for the developing world. To those who urgently need one, a wheelchair is a symbol, a sign marking a new start, one filled with hope for a better life. Your generous donation is very much appreciated, and 100 percent of your contribution will go directly towards purchasing the wheelchairs, which will be distributed directly to those adults and children who are most in need. 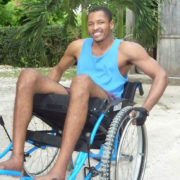 Simply click on the “Donate” link to make a contribution towards purchasing wheelchairs for Haiti today.